Grey's Anatomy Promo: Happy 300! It has been 14 seasons of Grey's Anatomy! With that, the 300th episode of the series is upon us. Grey's Anatomy Season 14 Episode 7 will be a celebration of this momentous occasion. That's 300 episodes of laughter and tears. Three-hundred episodes worth of highs and lows, love and loss, and more disasters than any show could possibly have. There have been amazing introductions and devastating farewells. There has been a slew of characters of all types over the years. McSteamy and Teddy, Erica and Stephanie. Characters have spun off into their own shows, Addison Montgomery-Shepherd, and characters have come from spin-offs and found a home in Seattle (Amelia Shepherd). There have been memorable patients who will never be forgotten, like Denny and Henry. And others, that we wish we could forget, like Eva. The characters have touched our hearts. The friendships have touched our souls, and then there have been some of the most iconic romantic ships in television history. When the doctors of GSM take on a case involving a freak accident with a roller coaster at the county fair, their patients spark memories of loved ones from their past. It looks like the one incident is eerily similar to a case involving two strangers and a pole, and this time, these two strangers spark memories of George and Cristina. Their patients aren't too thrilled about the doctors taking a trip down memory lane, but we sure will be. Seriously. It's an episode that will surely focus on the originals more than anything, but some focus will be on the newer people too. The new interns make their professional debut on their first day at GSM. Will they be as memorable as the characters whose journey we followed from the beginning? 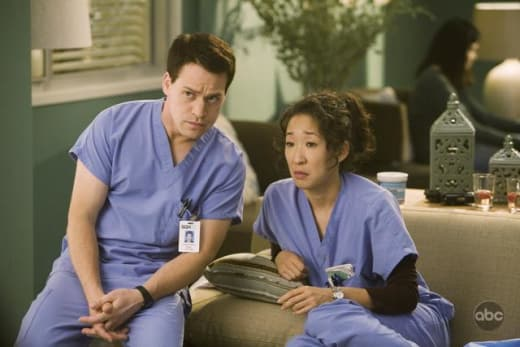 Will they pale in comparison to the second batch of interns now residents, who we've come to love? Whose to say? Things appear to be heating up between Carina and Owen, as the unexpected ship sets sail. And will Ben tell Bailey about his latest passion and eventual departure? Grab some tissues and tequila. Dance it out. Listen to The Fray or Snow Patrol if you have to. Whatever it takes to prepare you for this special hour. If you'd like to take a trip down memory lane before the episode airs, you can watch Grey's Anatomy online right here via TV Fanatic. Check out the promo for "Who Lives, Who Dies, Who Tells Your Story" below!